When choosing fabric to replace your patio cushions, the key to ensuring your fabric last long is to select a fabric that suits your surroundings. Exposure to the elements will cause your cushions to fade and deteriorate. Here are some smart tips on how to buy your next set of replacement patio cushions. 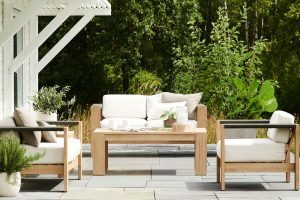 Although your patio may be covered, your furniture may be subject to winds, moisture, and extreme hot and cold weather. Therefore, it is a good choice look at water resistant or waterproof fabrics that are also fade and mildew resistant. Here are some fabrics that are a good choice for outdoor furniture. Cotton canvas – Cotton canvas fabrics are a good choice because they are inexpensive and easy to dye and paint. However, it is important to treat your cotton with a protective coating before using it. Duck cloth – Duck cloth is a tighter weave, which makes it smoother and more comfortable than cotton canvas. Since duck cloth is difficult to paint and customize as it is heavier, buy a color and design that suits your space. Textilene fabric – Textilene fabric is a woven polyester fabric with a PVC coating. Textilene is waterproof and fade resistant, and therefore ideal for outdoor spaces that get wet and exposed to the sun. Olefin Fiber – A synthetic fiber, Olefin will stand up against mold, heat, sun, and wet weather. However, Olefin can feel synthetic and hot to the touch. Wicker Paradise suggests listing out your requirements for your cushions, before visiting a store to buy your fabric.